Make Evernote-for-Windows Note-Tagging Consistent with Web-Clipper! I'm using EN-for-Windows, version 6.16.4.8094 (308094) Public (CE Build ce-58.1.6897). When using EN Web Clipper in Google Chrome on Windows PC, It's easy to find an existing Tag (or Notebook) to add to a new clipping/note. Just start entering some letters/characters and EN Clipper shows/suggests Tags where those letters appear, regardless if the letters appear at the beginning (prefix), middle (infix) or end of the Tag. So if I entered 'ipa' into the web clipper, looking for the above Tag, EN-Clipper would show/suggest the above Tag that could then be chosen... but not so on EN-for-Windows... at least AFAIK? Attached images shows the difference. Anyone else see or experience this, or know how to fix/workarounds etc? Hi. 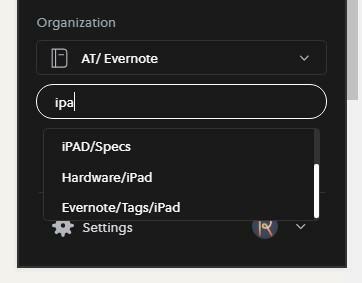 I can imagine entering long tags is a pain, and I'm sure that it's not that efficient - having an 'iPad' tag separate from a 'Hardware' tag would make for simpler and possibly more accurate searches. 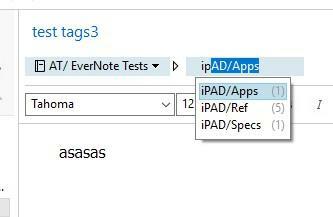 I do use multiple tags, but I also use a property of the tag field (including the Clipper tag field) where a string entered as "Evernote,Tags,iPad" - with the tags delimited by commas - will split into those three individual tags when I hit return. I was keeping my multiple tags in a note, so I could find, copy and paste any series' that I used a lot, but then I found that a text expander like Phrase Express can expand a simple code - like +T1 - into a longer selection like Evernote,Tags,iPad. If you prefer to continue with your system, you might try collapsing the left panel and using the drop-down menus from the icons. The search feature there seems partly to do what you require in that if I have a two separate word tag like "Evernote Tags" it will correctly find the search term as a separate word - where the note-based search will not - but if you close the space with another character (Evernote/Tags) it will not. There's a hotkey option to open a tag search window too, but I can't test that - it doesn't currently seem to be working for me... Hmnn. Might be another app hijacking that combo. Caveat: my Evernote version is the current beta. I know of no workarounds for what you are seeking. Sounds like a feature request to me. If you want me to move this topic to a feature request forum, I can do that. Per @jefito. no way to do this of which I am aware. Funny thing is the the option does exist for tag filtering but not for tag assigning. Think this just comes down to what you know v what you don't, and past decisions made based on this. But I do want a clean/organised Tag-View Screen... again I'm a very visual, OCD, hierarchical person. But always willing to change. e.g an image you shared on a post the other day re using List-View (with date clums 1st) ...well I now went from snippet view to List view...with 'Title' being the only column visible, I was like "why do i need thumbnails", BIG improvement. I also use a property of the tag field (including the Clipper tag field) where a string entered as "Evernote,Tags,iPad" - with the tags delimited by commas - will split into those three individual tags when I hit return. Per @jefito. n﻿o way to do this ﻿of which I am aware. F﻿unny thing is the the ﻿option does exist fo﻿r tag filtering but not for tag assignin﻿g. So maybe the 'Priorities for 2019' message from the new CEO, on the EN Blog, re making all things "more coherent, more consistent across platforms" will result in this tiny thing added to the list. You just have to drag the Tag to the Notes Tag-Field - NOT - the Note-Body, yippee.